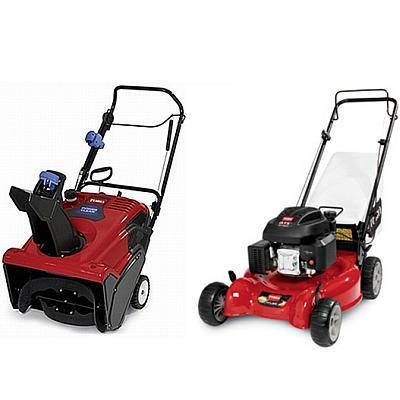 On April 26, 2011 Toro® Power ClearTM Snow Blower and Push Recycler Mower have been jointly recalled. This Joint Recall is with Toro, Health Canada, and the United States Consumer Product Safety Commission (US CPSC). This recall involves 2010 and 2011 Toro® Power ClearTM 421Q snow blowers that are red with black base and handles, and Toro® 51 centimeters (20 inches) Push Recycler power walk lawn mowers that are red with black base and handles. The carburetor for the snow blower and lawn mower can develop a fuel leak and can ignite when exposed to an ignition source, posing a fire or burn hazard to the operator. In the United States, Toro has received 500 reports of leaking carburetors. There have been no reports of fires or injuries related to the use of these products. In Canada, Toro and Health Canada are aware of 200 incidents of leaking fuel from a carburetor. There have been no reports of fires or injuries related to the use of these products. You should immediately stop using the snow blowers and lawn mowers, and contact a Toro service dealer for a free repair. You should contact Toro to determine if their snow blower and/or lawn mower are included in this recall or to find the location of the closest Toro service dealer. For more information, you may contact Toro toll-free at 1-877-738-4440, between 8a.m. and 4:30 p.m. CT, Monday through Friday, or visit the Toro company website. How many were sold and where? Approximately 5,000 units of the recalled snow blowers were sold in Canada at authorized Toro dealers. Although the recalled lawn mowers were not directly sold in Canada, approximately 200 units were registered by Canadian owners who purchased the lawn mowers in the United States. In the United States, approximately 18,000 units of the recalled snow blowers and approximately 6,000 units of the recalled lawn mowers were sold at authorized Toro dealers nationwide. The recalled snow blowers were sold from September 2009 to January 2011. The recalled lawn mowers were sold from April 2010 to March 2011. The snow blower was manufactured in the United States; the lawn mower was manufactured in Mexico. The manufacturer is The Toro Company of Bloomington, Minnesota.